I used to have cosy tea time ceremonies with my mother and my sister on the weekends, just the three of us. We lit candles, got comfy in between piles of cushions and listened to music. I always wanted to play either Prokofiev’s Peter and the Wolf or Ravel’s Bolero, both dramatic and mesmerising. It fascinated me as a child, especially Prokofiev’s musical fairy tale, just a narrator telling the exciting story and an orchestra interpreting the characters and scenes. It made me feel like I was right in the story, I could see Peter following the cat through the grass and then, the scene when the duck escapes through the garden gate which little Peter had left open! He shouldn’t have because of the wolf (his grandfather had told him a million times) and as one can imagine, it doesn’t look so good for the duck. I don’t want to reveal the end of the story, I still love listening to it! 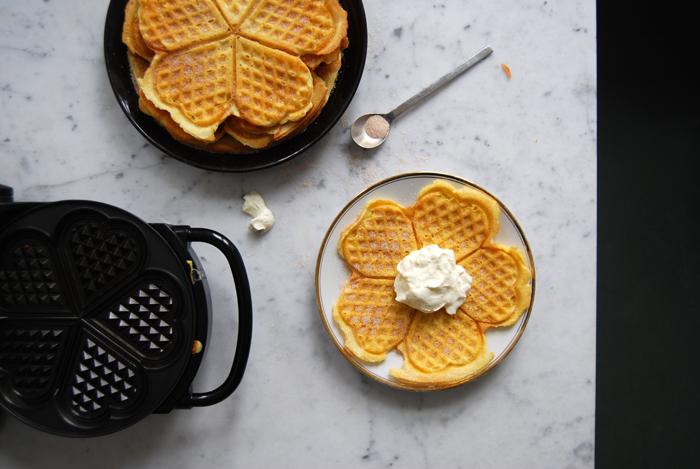 When we had our girly afternoons, we either baked a cake or made waffles, my grandmother’s waffles who passed her much-loved recipe on to my mother and her siblings before the grandchildren started baking them as well. 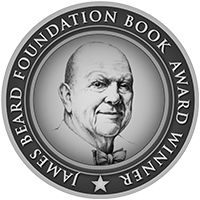 I’m one of them, still enjoying them as much as my family does. I never made any other waffle recipe myself but I’ve obviously had others. I’m biased, I know, never as good as my granny’s! Hers are light and fluffy, not too sweet as the dough is made with only a pinch of sugar. She used to sprinkle the sugar on top of the waffles after they were baked, still warm out of the waffle maker, which is how I make them too, sometimes with some cinnamon mixed in. When I thought of my grandmother, I remembered her gold rimmed plates which I don’t use very often. I ate my waffles like I always do, sandwiched with whipped cream in between and I played Peter and the Wolf, all the sweet memories came back and with them a happy and thankful feeling! 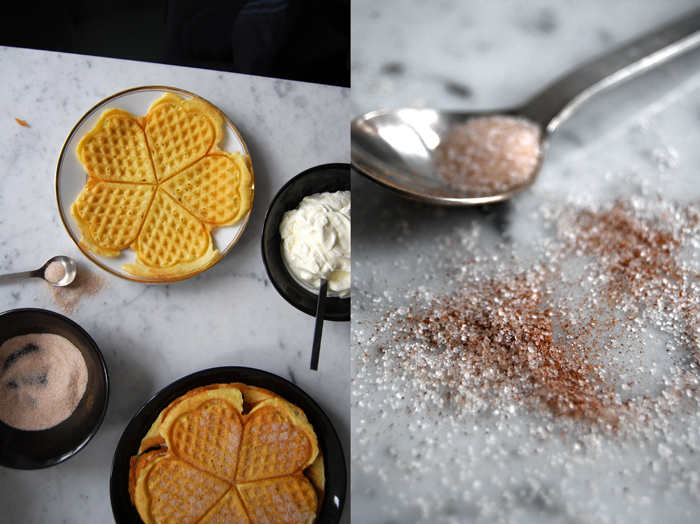 Combine the sugar and cinnamon to sprinkle on the waffles and whip the cream together with a tablespoon of sugar. Melt the butter and mix with the milk. Combine the flour and baking powder. Beat the egg whites with a pinch of salt till stiff. Mix the egg yolks with the sugar and vanilla till fluffy and add the milk and flour, mix well. With a spoon, fold the stiff egg whites gently into the dough until well combined. 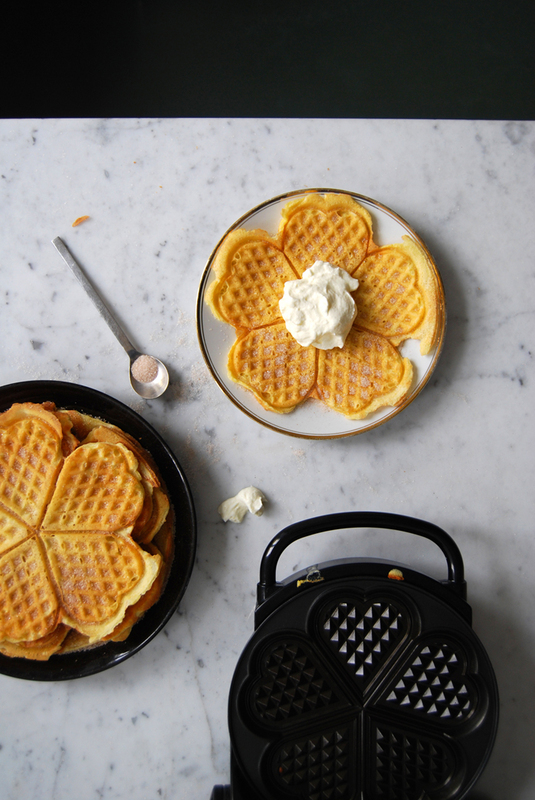 Pour a ladle of the dough onto the waffle maker and bake until golden brown. 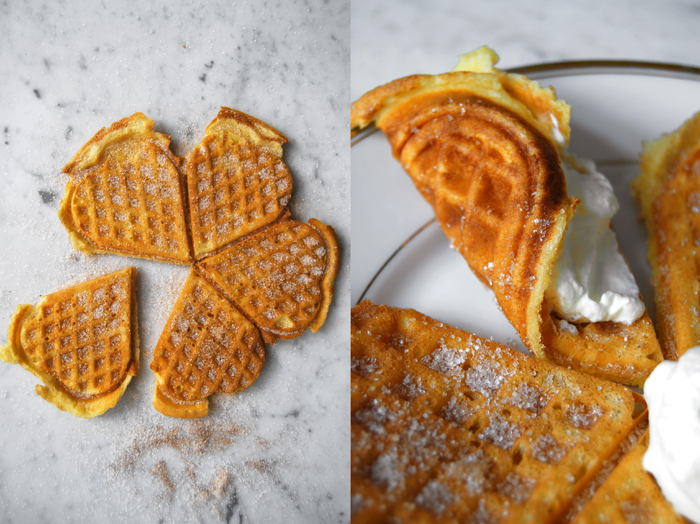 Sprinkle with the cinnamon sugar while the waffles are still warm and served with whipped cream. 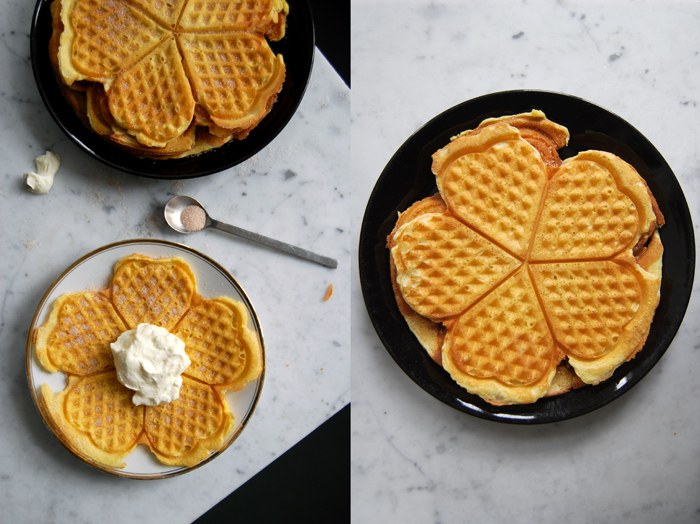 Meike, I made this recipe over the weekend, and you are right– these waffles are wonderful. I had to add more flour and a bit of baking powder because my waffle maker was not taking the batter too well (it is a “deep pocket” Belgian style waffle maker). 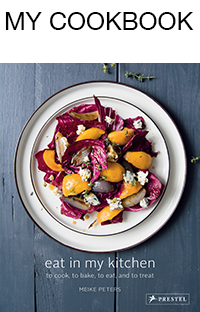 The final result was still great– light and tender. We ate them with a bit of butter on top, sprinkled with sugar. Thanks for sharing this and your Prokofiev story:) I grew up listening to it too, in Russia. Thank you for telling me Mila! I will add a note in the recipe that the dough needs less milk for a Belgian style waffle maker. I’m happy you liked the waffles! I always loved Prokofiev’s work!